TORONTO, ON – The 2011 edition of the Canadian Culinary Book Awards, honouring books published in 2010, was held yesterday at the Royal Agricultural Winter Fair in Toronto, and a beer book from Quebec took one of the top awards. La route des grands crus de la bière by Martin Thibault and David Lévesque Gendron was awarded Gold in the “Special Interest Category, French-Language”. The book covers many aspects of beer and brewing, with a special focus on the breweries of Quebec and New England, and content including brewery profiles, tasting notes, and suggested travel routes to visit many of the featured breweries. 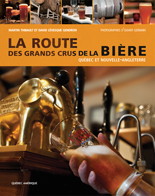 In addition to the book, Martin and David are authors of Les Coureurs des Boires, a French-language blog on beer travel.